Almost every founder of every discipline, whether spiritual or martial, has lived by this tenet. It sounds ridiculous to the average layperson. But martial artists routinely perform feats that defy the ordinary. We are what we think. Actually, it's conceptual thinking that usually gets in our way. The classical warrior immersed himself into his daily regimen of meditation because he knew it connected him to a larger ground of possibilities, particularly in battle. 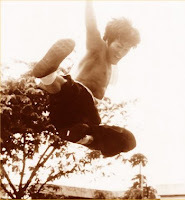 In his book, "Beyond The Known - The Ultimate Goal of the Martial Arts," Tri Thong Dang writes, "(the warrior) must be independent of any reasoning processes...allowing the emergence of true energy...the source of all possibilities." This source of all possibilities is none other than ourselves.